sound diver troubles w MOTU? it always, no matter what connection (tried both USB and serial) times out when trying to connect to the devices. as i mentioned previously, all other apps see the midi and work properly, so this is clearly a problem with sound diver itself. just curious if there is some trick to this, or if there is some known incompatibility between the two. Re: sound diver troubles w MOTU? sysex-in is turned on in your current OMS setup? it is filtered by default when i remember right. im not familiar with that option.. any idea where that setting would be located? or is this something that must be done with the MOTU options? i dont see anything in the per-port editor regarding sysex filtering. am i looking in the wrong place? hrm. 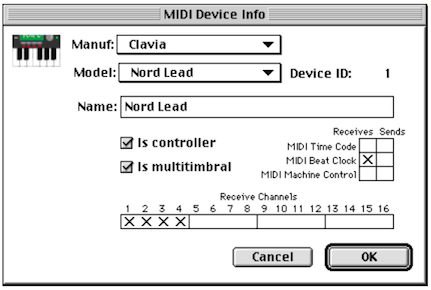 ive been doing a lot of research today and finding lots of problems from people trying to use these MOTUs with SD. im going to see about firing up my Unitor8s this weekend and see if the problem continues. one interesting thing i did find is that the OS9 version of MOTU clockworks gives a lot more configuration options than the OSX version does. or at least makes it more readily accessible. 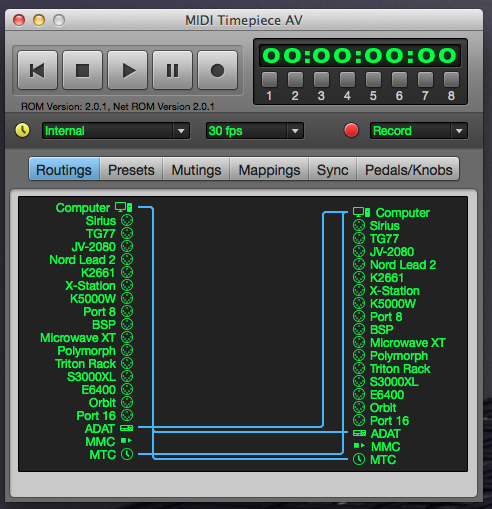 hm, only mtc and clock... seems i remembered wrong. well, a single unitor8 works just fine... im going to test what happens with a single MOTU. maybe it doesnt like my MOTU network? works just fine with a single MOTU... wonder if its just not compatible with networked interfaces, or if it needs to be set up a specific way. [edit 2] SOLVED!!! in my particular environment, the MTP connected to my OS9 mac was "unit #2" in the chain, set to ID 9-16. I changed this to 1-8 and the other unit to 9-16, and it stopped complaining and is now working properly. of course, i now need to go back to my OSX machine and change all the midi ports there, but at least OSX is a lot less picky about things. so i opened up the two side by side, OS9 and OSX versions... and they're different!! 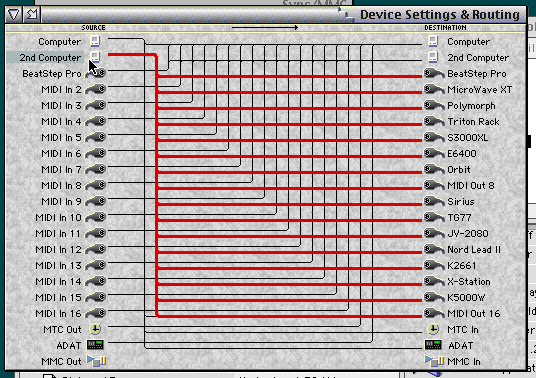 the OSX version has absolutely no provision for setting up routing to and from the second computer. it appears that by default, almost nothing is being routed to the second computer. 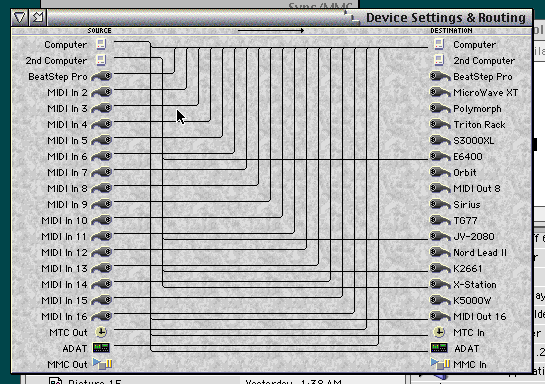 In Clockworks OS9, I went in and manually drew out all the device connections (as shown in red in the third picture) for both to and from devices. This fully solved the problem, finally. both OSX and OS9 machines attached to either end of the MOTU network are now working 100% without issue. the only head-scratcher remaining is how *some* devices had existing routing from the second mac port, but not all of them. i didnt do that myself, at least, not intentionally. it seems pretty wild that MOTU would have completely removed the ability to edit routing to/from the second computer. and its not a matter of it not seeing it, if you look in below the transport bar it shows the firmware for both units, the second one being noted by "NET" in front.